The fatal attack at the Ft. Lauderdale, Fla., airport Friday has sparked new concerns about passenger safety, with passenger groups, TSA officers and lawmakers all calling for tighter security in non-secure areas -- the parts of airports that are accessible to the general public, which includes baggage claim areas in many airports. Five people were killed and eight others wounded last week when a man opened fire in a baggage claim area. Authorities say a 26-year-old Iraq War veteran arrived at Ft. Lauderdale aboard a flight originating in Alaska. After retrieving his handgun from his checked baggage, they say he went into a restroom to load it. Authorities say when Esteban Santiago emerged he began firing at people at random. When he ran out of ammunition, they say he lay down on the floor and waited to be arrested. "This horrific shooting is just another reminder that more needs to be done to secure our nation's airports," J. David Cox Sr., national president of the American Federation of Government Employees, said in a statement. "AFGE has long-called for extensive training for TSA Officers and the creation of a new unit of trained and armed law enforcement officers within TSA at airports nationwide. Lawmakers and airport officials must implement increased security measures to ensure the safety of passengers and all airport personnel." After the 2015 shooting at Los Angeles International Airport left a TSA officer dead, lawmakers tasked TSA with reassessing the whole question of airport security, particularly in perimeter areas. But as is often the case in Washington, not much happened. Now lawmakers are again calling for action. 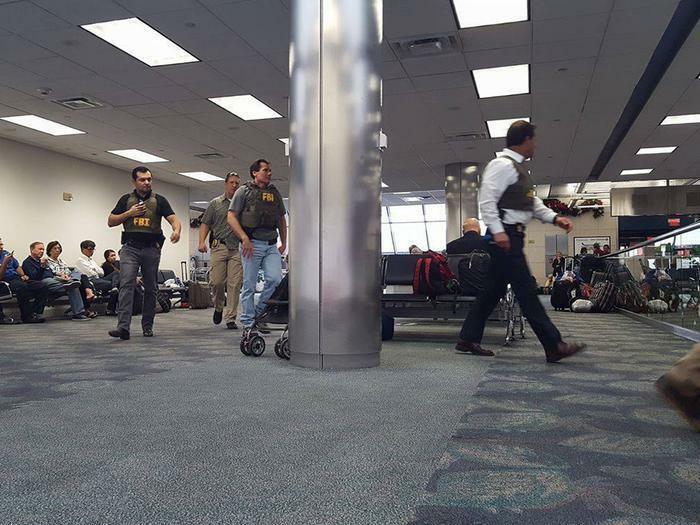 "There's no question we need to review not only the question of whether people should be able to travel with their firearms even if they're in checked baggage, but I think we need to take a hard look at the security around baggage claim areas, and not just leave it at that," Democratic Rep. Debbie Wasserman-Schultz of Florida said, according to the Associated Press. At this point police and intelligence agencies aren't sure of the motivation for the attack, but note that Santiago had recently been treated for numerous mental health issues since his discharge from the army. He reportedly told the FBI at one point that he believed the government was controlling his mind, forcing him to watch ISIS videos. In its statement, FlyersRights.org noted that it had asked the Transportation Security Administration (TSA) and Congress to provide for stronger airport security after a shooting attack at Los Angeles International (LAX) Airport in 2013. It said it renewed the request last July after the Brussels and Istanbul airport massacres, but said nothing was done. The group said it wants to see the use of the National Guard as a temporary security force at the nation's airports. It also calls for the installation of airport perimeter security to detect weapons and other threats. Other measures include a ban on live ammunition in checked bags; increased use of canine patrols to detect explosives; and putting anyone who is deemed a security threat by a law enforcement agency on the TSA Watch or No Fly list, but with due process means for removal. "Those victims at Ft. Lauderdale should not have died, and should certainly not have died in vain,” said Paul Hudson, president of FlyersRights.org. “Blood on the ground is unfortunately too often the price for government officials to act."